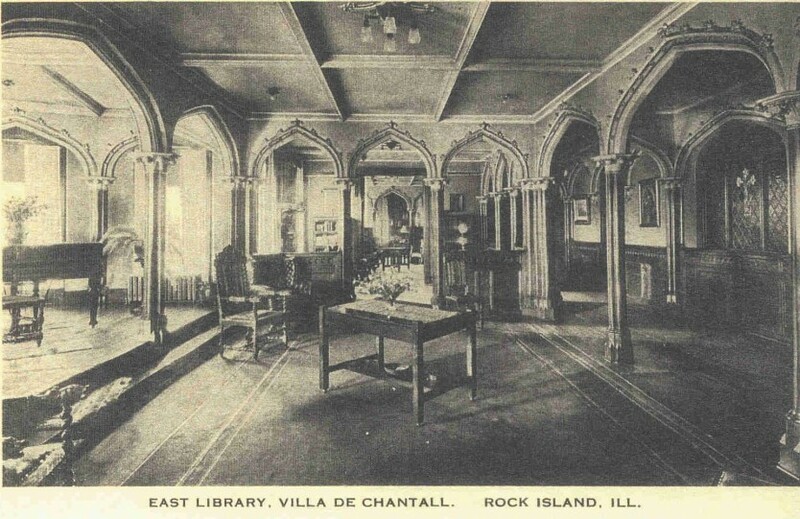 This ornate room, identified as the East Library in the featured postcard, is located at the top of the stairs at the main entrance to Rock Island’s Villa de Chantal. As the Real Photo postcard, from Shannon Hall’s collection shows, the room features highly decorated Gothic arches resting on Corinthian columns. There is a raised stage area to the left on the postcard that appears to house a baby grand piano. The walls are adorned with oak paneling. The ceiling is coffered. There are tables for study and chairs for reading. But there are no books, although one of the smaller rooms off the corridor at the right of our picture does contain book cases. A 1965 book about the Villa, Bells on Two Rivers, identifies the room pictured here as a parlor. Another postcard of the same era shows a different view identified as the Central Library but both of these postcards misspell “Chantal,” so their identification of “library” is also taken with a grain of salt. 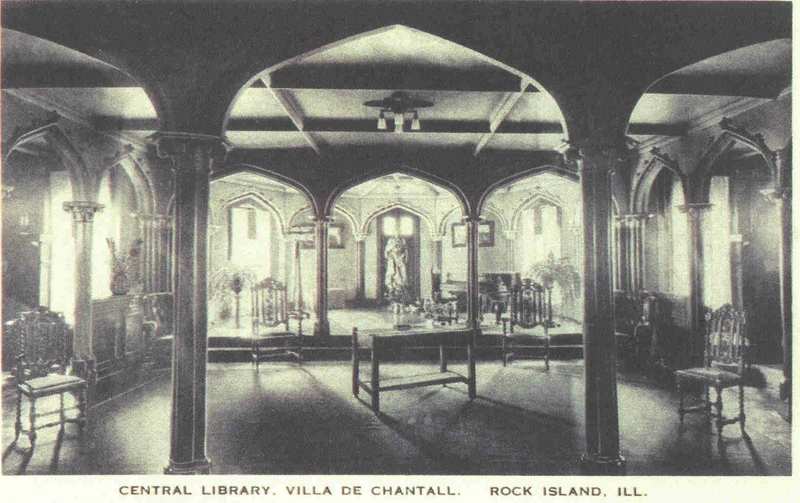 The Villa de Chantal was a Catholic boarding school. The school was established in 1901 by the Sisters of the Visitation of Maysville, Kentucky. They were invited to come here for the expressed purpose of operating an all-girls boarding school. The school was originally operated on 5th Avenue near Sacred Heart Church. But as the number of students grew, larger quarters were required. In 1900 the Visitandine sisters purchased a 15 acre parcel of land on the bluff on the south side of Rock Island. The parcel was located just to the north of the newly platted Highland Park Addition. The growth of the school and the Highland Park neighborhood would somewhat parallel one another. The third home to be built in Highland Park was the family home of Rock Island architect George Stauduhar. Mr. Stauduhar had designed both the Kelly and the Looney homes, but he was best known for designing Roman Catholic churches in the Neo-Gothic Revival style. Over two hundred churches of his design were constructed in the Upper Mississippi Valley. With this reputation and his presence in the neighborhood, Mr., Stauduhar was the logical choice when the Sisters of the Visitation were choosing someone to design their convent and academy. Stauduhar designed three buildings of the Villa de Chantal complex. The first building, eventually known as the Convent, initially served as classrooms and the living quarters for both the sisters and the students. Construction of the second building began in 1907. It would be the most ornate building in the complex with its Neo-Gothic main entrance framed by two crenellated towers. It contained a chapel, classrooms, student dormitory rooms, and our library room located directly behind the main entrance. The third Stauduhar structure, a Chaplain’s Bungalow, was built to the east of the complex in 1919. By 1915, the Villa de Chantal provided instruction for children in kindergarten thru 12th grade. The school could accommodate sixty boarding and 150 day students. Twenty students graduated from the academy that year. Highland Park had become the neighborhood Mr. Kelly envisioned and three more homes were designed by George Stauduhar. They took their places amidst the high style homes representing a variety of architectural styles including Classical Revival, Greek Revival, Craftsman, Dutch Colonial Revival, Foursquare, Prairie, Queen Anne and Spanish Colonial Revival. Daughters of many of the families living in Highland Park, including the Stauduhars, attended school at the Villa de Chantal. The educational heritage of the school had a lasting influence on its students. Academics focused on both general education and college preparation. The school was especially well known for its art and music offerings. In 1918, the senior play was Twelfth Night, and it was presented to the public on the evening of May 29th. Tickets cost fifty cents. The physical education of the students was attended to as well. Students could take swimming lessons, learn horsemanship or play tennis. The school, its reputation and the list of prominent alumni continued to grow. 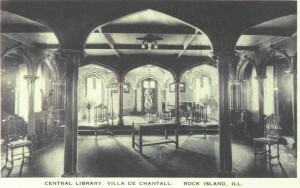 The fact that this post card is titled East Library would indicate that it was printed before Lewis Hall was added to the Villa de Chantal complex in 1929. Once Lewis Hall was built, the building that housed the library room became known as the center or Chapel section of the complex. The continued growth of the school required the building of Lewis Hall. It contained added classrooms, dorm rooms, cafeteria, kitchen and a 3-story gymnasium. The decision was made in 1958 to close the boarding school and focus exclusively on the day school. The last high school class graduated in 1975. The Sisters of the Visitation continued to live on the property for another 20 years. When they left the complex, the Villa de Chantal was sold to private owners. The Villa de Chantal was designated a local landmark in 1994, and later was listed on the National Register of Historic Places as the Villa de Chantal Historic District. For more history and architectural information on the Villa de Chantal and Highland Park, pick up the free, full-color Highland Park Historic District walking tour book at the Rock Island Public Library or City Hall. Alas, the Villa area shown on these postcards was destroyed by fire in 2005, and the remaining building, the former school was demolished later. A new public school stands on the site. This article by Linda Anderson is slightly modified from the original, which appeared in the Rock Island Argus and Moline Dispatch on April 3, 2005.